Christmas has well and truly come early at Guts Casino this year – they cannot wait for the festive period to start so have decided to bring it forward 3 months. As a result, they are giving away a brand-new iPhone X AND iPad every day this month! The Guts-Mas Comes Early promotion runs until the 30th of September (2018) with a brand-new iPhone X (256GB) and iPad 9.7 Inch (128GB) being given away every single day – yes, you read that right. To take part, you need to opt in via the ‘Promotions’ page. 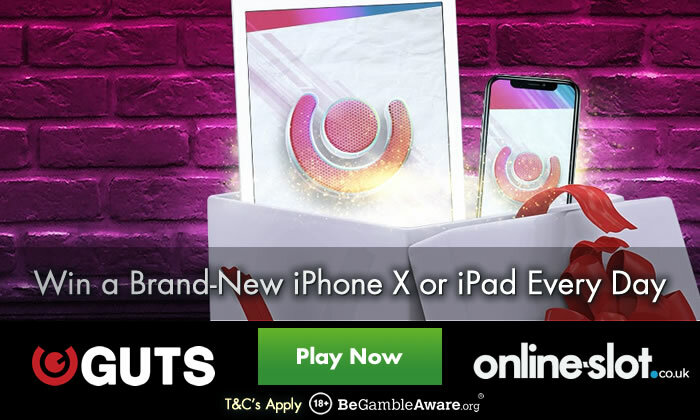 Then you need to wager £10 on any slot found at Guts Casino on a given day – the more days you do this, the higher your chances of winning either an iPhone X or iPad. With a maximum of 1 entry per day allowed, 1 player will be randomly selected to win the iPhone X and 1 to win the iPad. The prize draw takes place the following day by 4pm UK time with the winning players notified by an onsite message. If you are a lucky winner, you will be given a voucher code and a link in order to claim your prize. With 17 days remaining in September, you have 17 chances to win an iPad and 17 chances to win an iPhone X. When it comes to wagering £10 on any slot, you have a wealth of choices at Guts Casino – they have games from Play ‘N Go, Microgaming, Quickspin, Thunderkick, Red Tiger Gaming, Yggdrasil Gaming, WMS, NetEnt, Big Time Gaming, ELK Studios, Push Gaming, IGT and many others. I like the fact they have a large range of Novomatic slots including Almighty Reels Realm of Poseidon, Stein Haus, Book of Ra Deluxe, From Dusk Till Dawn and the brand-new Jaguar Moon. The jungle themed title is all about the Free Games feature where you can play with up to 20 free spins with a 5x multiplier for wins of up to 2,500 times your stake on each of them! Other new slots they offer you include Play ‘N Go’s Rise of Olympus, Big Time Gaming’s Donuts and Quickspin’s Eastern Emeralds. Not got an account? Sign up to get a 200% first deposit bonus up to £100 (i.e. deposit £50, get a £100 bonus). You’ll also get 20 free spins daily for 5 days on Play ‘N Go’s Book of Dead. 1 last thing – make sure you deposit using your debit or credit card as e-wallets such as NETeller and Skrill are not eligible for the welcome offer.